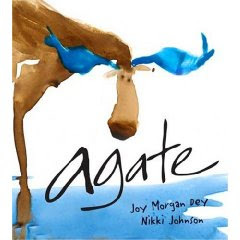 "Agate" is the story of a moose who thinks there is nothing special about himself. He sees the unique traits of each of his animal friends, but wonders, "What good is a moose?" The watercolor illustrations of his friends, each named after and painted in the color of birthstones, are exquisite. On each page, you learn unique traits of each of the animals, even the moose! A fabulous read before a trip to the zoo.